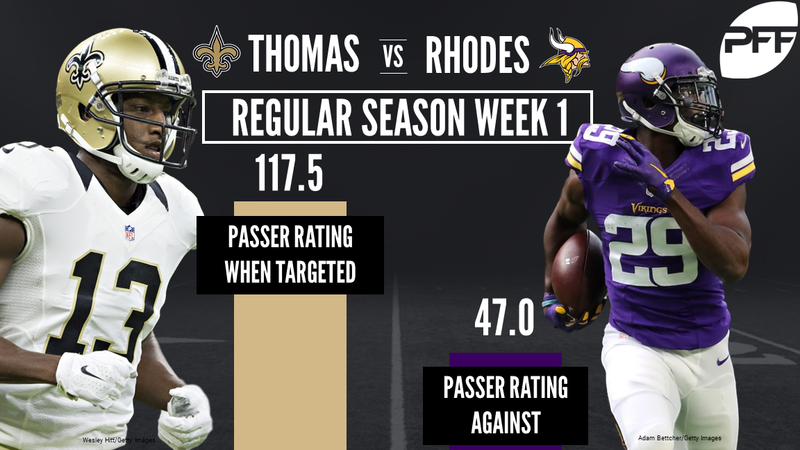 WR Michael Thomas vs. CB Xavier Rhodes – Thomas burst onto the scene as a rookie last season, earning the fifth-highest grade among 115 qualifying receivers at 89.0 overall. Thomas, who caught passes traveling 20 or more yards downfield at the third-highest rate (63.6 percent) is not just a difficult cover, he is hard to get on the ground with the ball in his hands. His 20 forced missed tackles ranked fourth among receivers. Rhodes had a down year in terms of overall grade, earning just a 78.6 and ranking 29th among cornerbacks. Being part of a solid defense however, Rhodes still led the NFL in passer rating against of just 47.0 and ranked second in completion rating against at just 48.0 percent. He will most likely be tasked with stopping Thomas. T Ryan Ramczyk vs. Edge Everson Griffen – Ramczyk was the Saints’ top pick in the draft this past year, and he had a solid preseason. He’ll be defending Drew Brees’ blind side to start his career, so it’s important that he only gave up one pressure all preseason, although he did only have 21 pass-blocking snaps. Of his 523 pass-rushing snaps last year, Griffen had 98.9 percent of them come rushing from the right side, leading to a direct matchup with Ramczyk. Griffen’s pass-rush productivity was 10.1 last year, which ranked 16th among 4-3 defensive ends last year. He’ll be a stiff test for the rookie. RB Mark Ingram vs. LB Anthony Barr – Adrian Peterson may be in town, but Ingram should retain a role in the offense. Ingram was 11th in the NFL in breakaway percentage, which measures the percentage of yardage a runner gets on big plays (15-plus yards) and his elusiveness rating of 58.6 ranked fourth last year. Barr is one of the better pass-rushers among 4-3 outside linebackers, as his 11.1 PRP was seventh among that group, but he could stand to improve his run defense. His 5.5 percent run-stop percentage was 15th out of 17 qualifying 4-3 outside linebackers last year. WR Adam Thielen vs. S Kenny Vaccaro – Thielen broke out last season earning an overall PFF grade of 83.1 which ranked 19th among receivers. During the preseason Thielen ran the majority of his routes from the slot, and will be the main weapon for quarterback Sam Bradford in the slot this season. 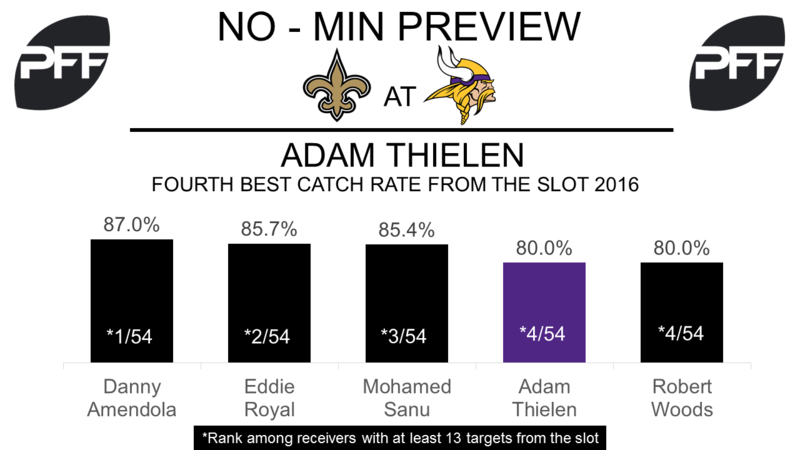 In 2016 Thielen showed potential to be a great slot receiver, his catch rate of 80% was the fourth best by a receiver. His 1.90 yards per route run from the slot was the eighth best in 2016. Vaccaro will be the man to line-up opposite Thielen in the slot. Vaccaro played 185 snaps in the slot last season, the most of any Saints cornerback and only allowed a passer rating of 83.6 when quarterbacks targeted him, which was the 11th best in 2016. He was one of 11 corners not to allow a touchdown in 2016 when defending the slot. T Riley Reiff vs. Edge Cameron Jordan – The key battle on the line of scrimmage will see one of the Vikings key free-agent addition go head-to-head with one of the best edge defenders in the NFL. Reiff spent the 2016 season with the Detroit Lions, he struggled in pass protection, earning an average pass block grade of 70.6. He gave up 44 total pressures last year which was the 19th most by an offensive tackle and his pass-blocking efficiency of 94.0 ranked 44th among 73 qualifying tackles. Jordan was once again one of the premier edge defenders in the NFL, earning an overall PFF grade of 92.4 that was the third highest among edge defenders. His pass-rush grade of 90.3 was also the third highest. His 79 total pressures were tied for the fourth most among edge defenders. RB Dalvin Cook vs. LB Alex Anzalone – The Vikings top pick in the 2017 NFL draft was one of the best runners in college last season, his overall grade of 89.5 was the second highest in the nation and his 91 forced missed tackles running the ball were the most by a running back. Cook will go head-to-head with fellow rookie Alex Anzalone, who will start in the middle of the Saints defense. With Cook’s ability to make defenders miss, securing tackles will be vital to the success of the defense. Anzalone had a combined tackle efficiency of 7.3 in 2016 which ranked 27th among 51 qualifying SEC inside linebackers but he did miss six in the run game, the 17th most in the SEC.